In March 1899 Clemens wrote a fourteen page manuscript which was a short autobiography of himself in the third person voice. The manuscript was intended to be the basis for a closing essay for the final volume of a uniform edition of his works that was being prepared by publisher Frank Bliss for the American Publishing Company. According to Mark Twain biographer Justin Kaplan, the manuscript "can be read as a statement about himself by a man who had already in his lifetime become a legend, who continued to manipulate and redefine the symbols of which his legend was based, and who was driven by the need to impose order on a sprawling life which he often felt was without meaning" (Kaplan, p. 356). "Mrs. Clemens wishes you to ask Sam Moffett, my nephew (editor of the New York Journal) to write this biographical sketch from these notes & then she would like to see it before it is printed. SLC" (American Book Prices Current, p. 850). Owing to the number of unauthorized and largely apocryphal accounts of his life that have appeared in various countries, Mark Twain asked his nephew, Mr. Samuel E. Moffett, to write a sketch of him that should be authentic. The result was the present article, of which Mark Twain wrote, when it was submitted for his opinion, "This biographical sketch suits me entirely -- in simplicity, directness, dignity, lucidity -- in all ways." It so completely satisfied him that he has chosen it to appear in the collected subscription edition of his works, soon to be published by the American Publishing Company, and also with the German translations of his works (McClure's Magazine, vol. 13, October 1899, p. 523). 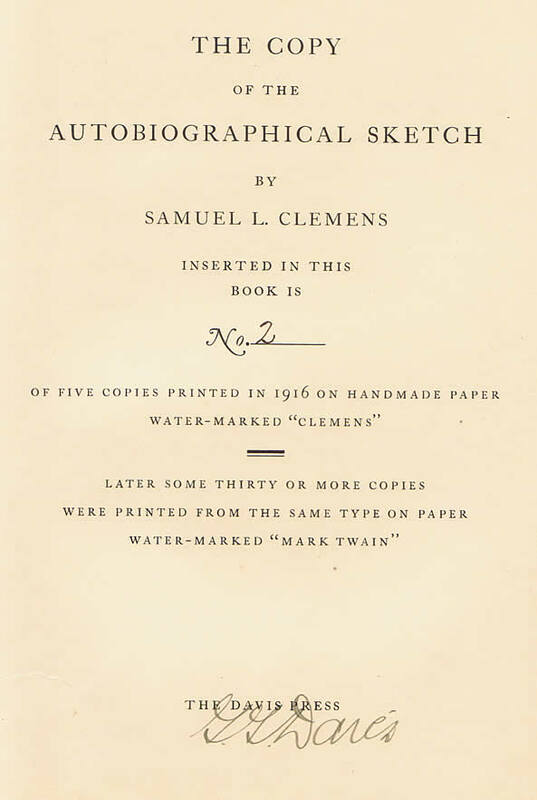 Clemens's autobiography, written in the third person, was later privately printed in very limited numbers in 1916, most likely by Walter Bliss in Hartford, Connecticut. 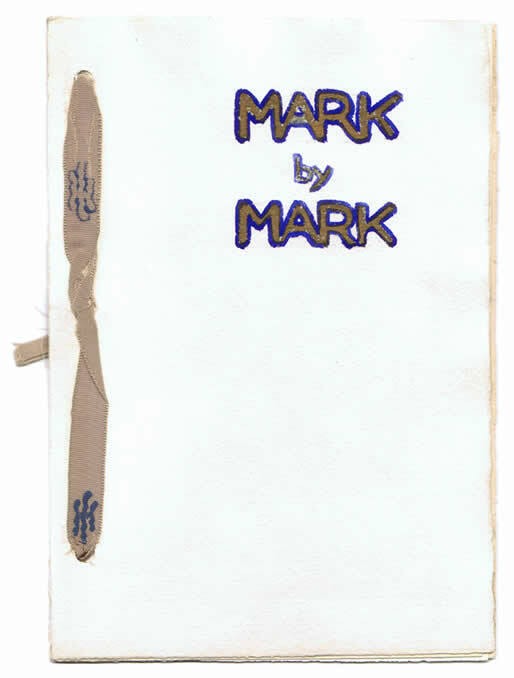 Two separate styles of paper formerly used in the 1899 uniform editions of Mark Twain's works with the CLEMENS and MARK TWAIN watermarks were used. Walter Bliss died March 16, 1917 without disclosing the actual printing numbers. The printing project would have been conducted in secrecy since Harper and Brothers might legally claim ownership of the manuscript. Bliss sold five copies of the autobiography printed on the CLEMENS watermark paper to rare book collector Willard S. Morse. In 1918 Morse, after acquiring additional copies printed on the MARK TWAIN watermark paper, had the Davis Press bind five books that contained the autobiography printed on CLEMENS watermark paper and the MARK TWAIN watermark paper. Morse's books featured a special title-page and preface giving the history of printings as he knew it. Special printing of the 1899 autobiography from the Kevin Mac Donnell collection. As many as seventy-five additional copies of the autobiography may have been printed on the MARK TWAIN watermark paper. Rare book dealer Merle Johnson re-issued about 35 of these copies in wrappers featuring a hand-drawn title page and silk ribbon. Born In Florida, Mo., Nov. 30th, 1835. Son of John Marshall Clemens, of Virginia, and Jane Lambton, of Kentucky. An ancestor (Jeoffrey Clement), was ambassador to Spain under Charles I., married a Spanish wife and introduced a strain of Spanish blood into the Clemens stock, which shows up now and then in a descendant yet. (Clara is an instance.) This Clement sat as one of Charles's judges on the trial that rendered the death verdict. The Lambtons still possess in England the lands occupied by their ancestors of the same name before the invasion of the Conqueror. The childhood of S. L. Clemens was spent in the village of Florida, his boyhood in the town of Hannibal, on the Mississippi. Before he was thirteen he had been rescued in a substantially drown condition nine times -- three times from the Mississippi and six times from Bear Creek. His mother's comment was: "People who are born to be hanged are safe in the water." S. L. Clemens's parents began their young married life in Lexington, Ky., with a small property in land and six inherited slaves. They presently removed to Jamestown, Tennessee; later to Florida, Mo., and finally to Hannibal, where Mr. Clemens served as a magistrate some years and was then elected County Judge, but died (1847) before he was invested with the office. S. L. Clemens was educated in the common school at Hannibal, and in his brother's newspaper office, where he served in all capacities, including staff work. His literature attracted the town's attention, "but not its admiration" -- (his brother's testimony). He ran away in 1853 and visited the World's Fair in New York. After a year's absence in the Atlantic States he was obliged by financial stress to reveal his whereabouts to the family. He returned to the West and lived in St. Louis, Muscatine, and Keokuk until 1857; he spent the next four years on the river between St. Louis and New Orleans, in the pilot house. He was in New Orleans when Louisiana went out of the Union, January 26, 1861, and started North the next day. Every day on the trip a blockade was closed by the boat, and the batteries at Jefferson Barracks (below St. Louis), fired two shots through her chimneys the last night of the voyage. In June he joined the Confederates in Ralls County, Mo., as a second lieutenant, under General Tom Harris, and came near having the distinction of being captured by Colonel Ulysses S. Grant. He resigned, after two weeks service in the field, explaining that he was "incapacitated by fatigue" through persistent retreating; became private secretary to his brother, who had been appointed Secretary of the new Territory of Nevada, and crossed the plains with him in the overland coach-an eighteen day and night trip. After a year spent in the silver mines of the Humboldt and Esmeralda regions he became local editor of the "Territorial Enterprise," at Virginia, Nevada, and also legislative correspondent for that paper from Carson City, the capital. He wrote a weekly letter to the paper; it appeared Sundays, and on Mondays the legislative proceedings were obstructed by the complaints of members, as a result. They rose to questions of privilege and answered the criticisms of the correspondent with bitterness, customarily describing him with elaborate and uncomplimentary phrases, for lack of a briefer way. To save their time, he presently began to sign the letters, using the Mississippi leadsman's call, "Mark Twain," (2 fathoms -- 12 feet) for this purpose. Dueling was in that day a custom there -- a temporary one. The weapons were always Colt's navy revolvers; distance, fifteen paces, fire, and advance; six shots allow. Mark Twain and Mr. Laird, editor of the Virginia "Union," got into a newspaper quarrel and a duel was appointed for dawn in a mountain gorge outside the town. Neither man was capable with a pistol; but this did not appear on the field, for an accident caused Mr. Laird to withdraw and apologise. The accident was this. The seconds of both parties were practicing their men in neighboring gorges with a concealing ridge between. Mr. Laird was making fairly good practice, but Mark Twain was hitting nothing. A small bird flew by and lit on a sage bush thirty yards away, and Mark Twain's second who was an expert, fired and knocked its head off. Just then the adverse , party came over the ridge to compare notes, and when they saw the dead bird and learned the distance, they were interested. When they further learned erroneously (from Gillis, Mark Twain's second) that Twain had done the shooting, and that it was not a remarkable feat for him, they were troubled. They drew aside and consulted, then returned and made a formal apology and the duel was "off." There was a new and stringent law which provided two year's imprisonment for any one who should send a challenge, carry a challenge, or receive one. The noise of the proposed duel had reached the capital, eighteen miles distant. Governor North was very angry and gave orders for the arrest of all concerned in the preliminaries of the duel; he said he would make an example that would be remembered. But a friend of the duelists got wind of the matter and outrode the officers of the law, arriving in time to hurry the parties over the frontier into California and save them from well-earned punishment. Mark Twain took service of the San Francisco "Morning Call" as city editor, and held the place a couple of years; then spent three months in the "pocket" mines of Calaveras County at Jackass Gulch, but found no pockets. He returned to San Francisco and wrote letters to the Virginia "Enterprise" for a while, and was then sent to the Sandwich Islands by the Sacramento "Union" to write about the sugar interest. While in Honolulu the survivors of the Clipper "Hornet" (burned on the line) arrived, mere skin and bone relics, after a passage of forty-three days in an open boat on ten day's provisions, and Mark Twain worked all day and all night and produced a full and complete account of the matter and flung it aboard a schooner which had already cast off. It was the only full account that went to California, and the "Union" paid Mark Twain ten-fold the current rates for it. On his return to California after a half-year's absence, he profitably delivered several lectures and then went east, 1867, and joined the "Quaker City" Excursion to Europe and the Holy Land; was gone five or six months, and upon his return wrote and published "The Innocents Abroad," 1869, which was an account of the voyage. The sale reached 100,000 copies in the first year, and doubled it later. In 1869 he entered the lecture field and traversed the eastern and western states. Remained in the field four years. In October 1871 he removed to Hartford, Conn., and presently built a house, which the family still retain. In 1872 Susan Olivia Clemens was born. "Roughing It" written. Also "The Gilded Age" (in collaboration with Charles Dudley Warner). In 1873 the family spent some months in England and Scotland; Mark Twain lectured a few weeks in London. In the succeeding years various books were written In 1874 Clara Langdon Clemens was born. In 1878 the family went to Europe and spent eighteen months. "A Tramp Abroad" resulted. Jean Clemens born, 1880. In 1885 Mark Twain financed the publishing house of Charles L. Webster & Co., in New York. Its first issue was the Memoirs of General Grant, which achieved a sale of more than 600,000 volumes. The first check received by the Grant heirs was for £200,000. It was followed a few months later by a check for $150,000. These are the largest checks ever paid for an author's work on either side of the Atlantic. In 1886-89 Mark Twain spent a large sum of money on a type-setting machine which was a failure. The money was all lost. The publishing house was incapably conducted, and wasted all the money that came into its hands. Mark Twain contributed $65,000 in efforts to save its life, but to no purpose. It finally failed (1894) with liabilities of $96,000 and assets worth less than a third of that amount. The privilege of paying the debts fell to Mark Twain's share. In 1895-96 Mark Twain, with his wife and second daughter, made a lecturing tour around the world, wrote "Following the Equator," and paid off the debts. Near the close of this absence of thirteen months, the eldest daughter, who had remained, at home, died, aged twenty-four years. The years of 1897-98-99 were spent by the family in England, Switzerland and Austria. Mark Twain was present in the Austrian Reichsrath on the memorable occasion when the House was invaded by sixty policemen and sixteen refractory Members dragged roughly out of it. A number of his books have been translated and published in France, Germany, Russia, Italy, Sweden, Norway and Hungary. Dramatizations of the "Gilded Age," "Tom Sawyer," "Prince and Pauper," and "Pudd'nhead Wilson" made good successes on the stage. Clemens's original manuscript was sold at American Art Galleries in New York on March 13, 1918. According to bibliographer Jacob Blanck, "this is a superb example of the artificial rarity-first edition" (Blanck, p. 222). American Book Prices Current, Vol. 24. 1918. (online from google books). Mac Donnell, Kevin. Personal correspondence, 17 April 2010.